With worse animation than it's video game. Try the video game shows from MY childhood: Pac-Man, Dragon's Lair, Saturday Supercade (OK, that was an anthology and a bit hit-or-miss). Certain parties may not agree but I liked them. I sadly haven't seen Dragon's Lair in years. There is *only* one interesting technical point to make about this cartoon: It was the first animated series to be motion capture animated in real time. No rendering at all! Which...you can sadly tell by looking at the thing. For more info on that. 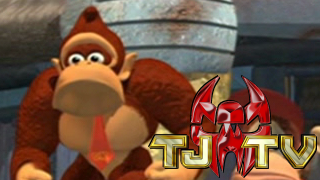 Also the Crystal Coconut showed up in DK64...which came out after this series. My GF and I love the show, can't wait for more! The less said about Sonic's first cartoon, the better. The Nostalgia Critic almost went crazy thanks to that trash-heap. The second cartoon was awesome, while the third one Sonic Underground? I like it for the music and nothing more. ^ I really like the first sonic cartoon even more then the second one which I think is overrated third one is just horrible. Peter has a complete disregard for everyone and everything around him! HA HA!...sociopath. Some times I like songs in cartoons like Phineas and Ferb other times, like Fraggle Rock, songs piss me off. but there was a dragnet movie, with tom hanks, also if you grew up with free over the air tv, as I did, then there were probably some re run channels.